ew York taxis can be spotted from a mile off due to their distinctive yellow colour. 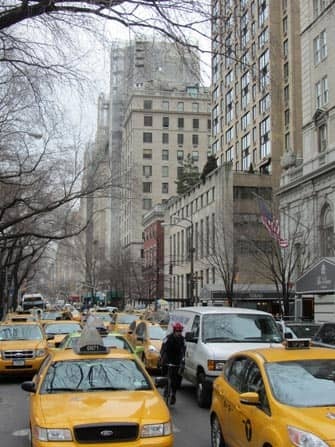 These yellow cabs are a great way to travel around the city. The base rate is $2.50, plus a few surcharges of $0.80 in total. 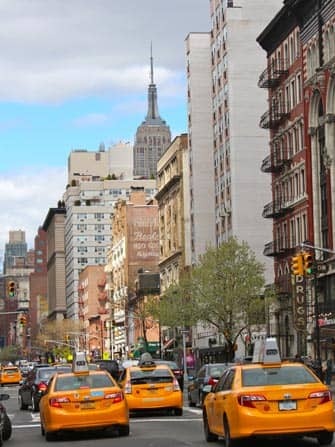 For all trips that begin, end or pass through Manhattan south of 96th Street a New York State Congestion Surcharge of $2.50 is added. In addition you pay 50 cents per 1/5 mile or, in slow traffic, per 60 seconds. You can get a taxi on the street if the light sign on the roof is on. If you want to travel more luxuriously, you can take a limousine. These are slightly more expensive, but much more elegant. Limos are not equipped with a meter, so you pay the agreed-upon amount discussed in advance. There are always taxis waiting at JFK Airport. 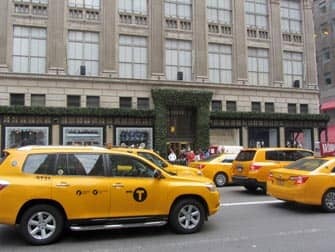 If you do not want to pay too much, take a yellow cab. Please note that taxis must offer a flat rate from JFK to Manhattan. However travelling from Manhattan to JFK they are free to charge more. To hail a cab in the streets of Manhattan you just raise your hand. The middle light on top of the taxi will be on when it’s free. If the light is off, the taxi is taken. When the taxi is “off-duty”, the off duty light will show. When you get in a New York taxi, you never tell the driver the address of where you wish to go. Rather, you provide the cross streets or intersection for where you are heading (e.g. 9th Avenue and 42nd Street). Additionally, upon arrival at your destination, you can still provide directions for where you want to get dropped off in order to get closer to where you want to go. Try to hail a cab that is driving in the same direction that you are headed: this will save you time and money. Officially 4 people are allowed in a taxi, but there needs to be enough room for the suitcases. If you have a lot of luggage you’ll need to take 2 taxis. The best alternative is to take the shuttle bus or larger bus when with bigger groups. Travelling with a taxi at night is often the easiest and safest option. There is a small surcharge. Between 20:00 – 06:00 you pay 0.50 cents extra. Also from Monday to Friday between 16:00 – 20:00, which are the peak traffic hours, you pay $1 extra. 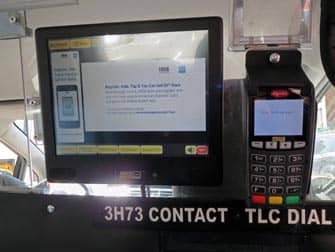 You can pay in the taxi by cash or credit card. When paying in cash don’t forget to tip. When you pay with credit card tipping has been made very easy: before swiping your card, the display shows you the total amount and an option to tip 20%, 25% or 30%. Click one of the options or alternatively add a smaller tip manually with the keypad. Manhattan’s 12,000 yellow cabs have been reinforced with lime-green cabs. 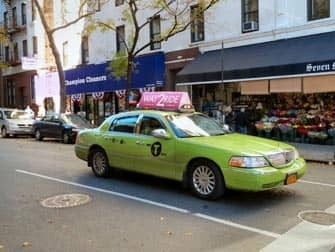 These taxis are only allowed to pick up customers in the northern parts and neighbourhoods of Manhattan(such as Harlem) and the outer boroughs (The Bronx, Queens & Brooklyn). Eric’s Tip: Real New Yorkers never tell the taxi driver where they are going to until they are already seated in the cab. This is because the cab drivers sometimes don’t want to take you to where you are going. However, if you are already seated in the taxi, then the driver must take you, because he can’t ask you to get out. 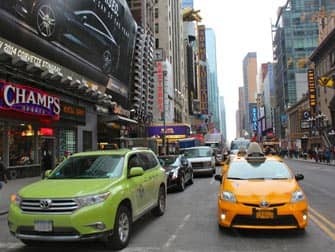 If you see a taxi that has its “Off Duty” sign on, still raise your hand to signal to the driver, because sometimes they are looking to pick up passengers who are heading to a location on their way home or only traveling longer distances. Between 16:00 and 19:00, it is very difficult to get a taxi, so keep this in mind if you want to be on time.